Jackson Hole/Vienna. For the 15th time, awards have been handed out by the prestigious Jackson Hole Wildlife Film Festival, based in Jackson Hole, Wyoming. All in all, a total of 25 awards were presented in a glamorous gala on the evening of Sept 28th, 2017. 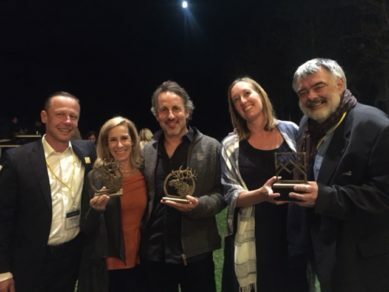 And a fifth of these 25 awards went to Vienna-based Terra Mater Factual Studios. ‘The Ivory Game’, an already multi-awarded thrilling feature documentary about the worldwide illegal ivory trade, was honoured with three awards in Jackson Hole. The film has already convinced many juries at film festivals around the globe not only in aesthetic and dramaturgical terms, but most of all with its political and societal message; a combination which put the film on the shortlist for the 2017 Academy Awards. At the Jackson Hole Wildlife Film Festival 2017, ‘The Ivory Game’ was honoured with the Best of Festival-award, the “Grand Teton Award”. Furthermore, it won in the categories “Best Writing” as well as “Best Theatrical Program”. 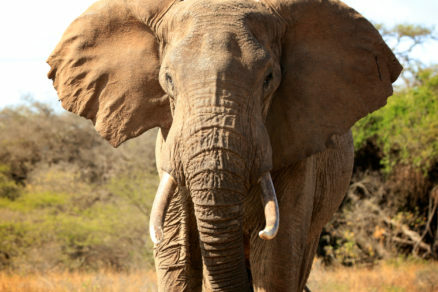 ‘The Ivory Game’, which has been shot in Kenya, Tanzania, Uganda, Zambia, Hong Kong, China and Vietnam, is a production of Terra Mater Film Studios with Vulcan Productions, a company of Microsoft-Co-Founder Paul Allen, and in association with Appian Way, production company of Leonardo DiCaprio. Allen as well as DiCaprio act as Executive Producers for the movie. Award-winning director Richard Ladkani and Academy Award®–nominated director Kief Davidson filmed undercover for 16 months with a crack team of intelligence operatives, undercover activists, passionate frontline rangers and tough-as-nails conservationists, to infiltrate the corrupt global network of ivory trafficking. Another of the prestigious 25 awards handed out yesterday evening went to the multi-awarded TMFS production ‘David Attenborough’s Light on Earth’. Natural History legend Sir David Attenborough’s performance as presenter led to the JHWFF 2017 award in the category “Best Host/Presenter Led-Program”. This science/nature documentary reveals never-before-seen behaviour of living creatures producing their own light with the help of specially-developed, extremely light sensitive cameras. ‘David Attenborough’s Light on Earth’ was produced by Terra Mater Factual Studios and Ammonite Films, in co-production with the American SVOD service CuriosityStream, and in association with BBC, UKTV and ABC Australia. A very special honour was bestowed on the TMFS production ‘Tribe versus Pride’, as it was awarded the “Special Jury Award” of the festival. Directed by renowned wildlife filmmakers Dereck and Beverly Joubert, this production closely follows how Kenya’s Maasai people celebrate their relationship with African lions; and how, to protect the latter, the Maasai people have gone as far as to change century-old rituals of their tribe. ‘Tribe versus Pride’ was produced by Terra Mater Factual Studios in co-production with Wildlife Films. The 25 prestigious awards were handed out during an award gala at the Center for the Arts in Jackson Hole, Wyoming, on the evening of September 28th, 2017. The winning films – 25 out of 600 – were screened and chosen by preliminary judges before the ceremony. Ahead of the festive event, a week-long media market took place in Jackson Hole, where filmmakers, journalists, scientists and conservationists were able to share contact details and ideas.